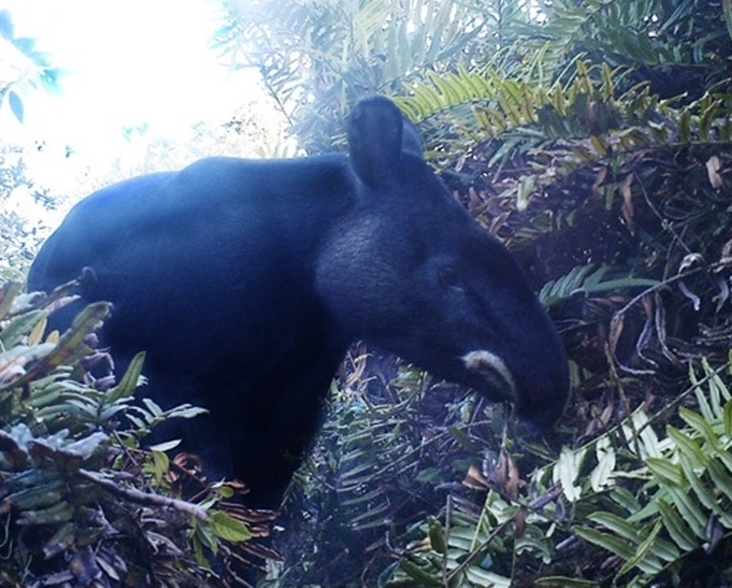 The Mountain Tapir is the smallest of the four species of tapir that exist today, but is the largest mammal found in the tropical Andes of South America). An adult can be 180cm long, stand 80cm at the shoulder and weigh between 150-250 kilograms. The Mountain Tapir is also known as the ‘woolly tapir’ due to its long, thick, woolly fur, which is coloured a dark brown to black. The tips of their ears are white, as is a distinctive line around the mouth. As with all tapir species they have a long, trunk like nose and their young have a dappled, camouflaged coat until they are a year old. Primarily solitary, recent evidence suggests that Mountain Tapirs may travel in pairs and congregate at natural salt licks. Tapirs are most active at late afternoon and early morning. They easily navigate the mountainous regions in which they live as they are sure-footed. Their diet comprises of leaves, twigs and fruits from a large number of plant species and they are important seed dispersers. There is no defined mating season. Typically one calf is produced every couple of years, staying with the mother for up to two years. 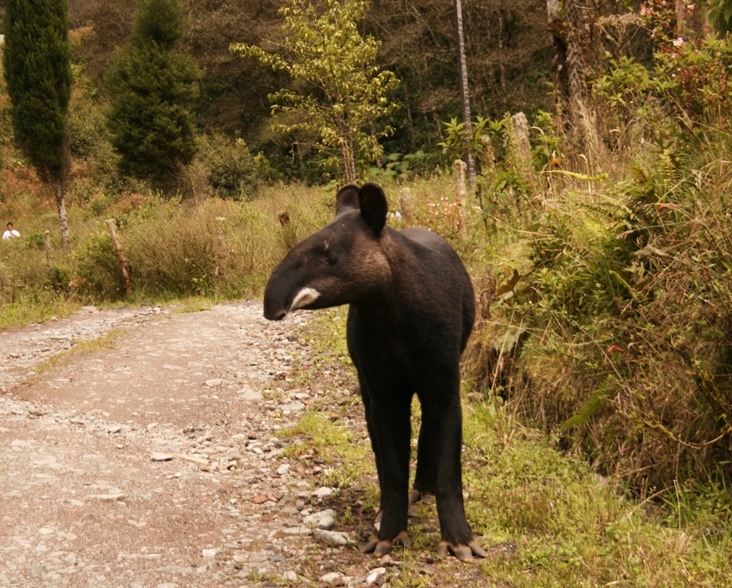 Mountain Tapirs are endemic to the Andes Mountains of north-western South America, found across Colombia, Ecuador and parts of Peru. They can be found at elevations of between 1,400 and 4,300 metres, in Andean forest and páramo. 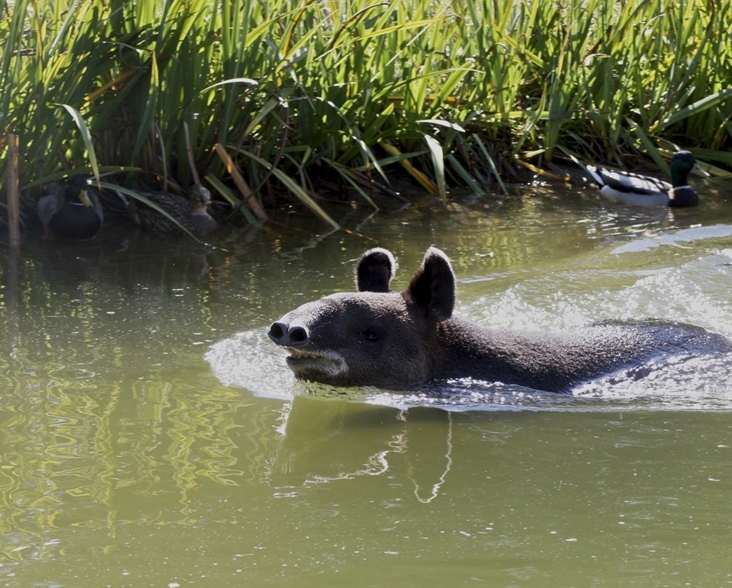 All species of tapir, including Mountain Tapir, are associated with water and mud, whether it is used to discourage biting flies, escape predators, or just cool down. The main threat facing the Mountain Tapir is the fragmentation and destruction of its habitat. This can be attributed to human population growth and spread of agriculture in the Andes. Mountain Tapir are hunted for their meat, but local regulations and increased awareness of their endangered status has significantly reduced this threat. There are estimated to be less than 2,500 mature individuals left in the wild.